Did Chan Brothers Travel just try to cheat me? My Japan trip is coming soon and one of the things I had to prepare is a JR Pass. 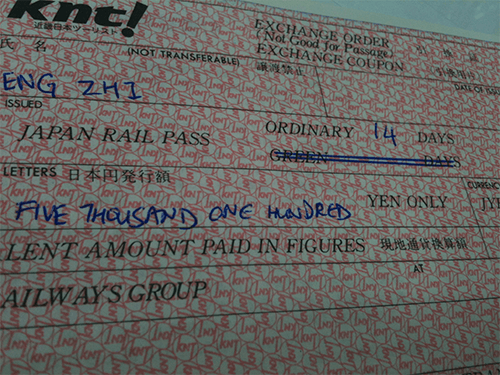 It’s basically a pass that allows me to travel on all JR trains and bullet trains for free (except NOZOMI bullet train). This is going to help save a lot especially when I’m planning to travel all the way down to Kyushu, stopping at Nagoya, Kyoto, Oosaka along the way. So I went to Chan Brothers Travel office because I’ve bought a 7-day pass from them 3 years ago. There, they told me they don’t sell 14-day passes, but are able to sell me two 7-day passes. From the JR Pass website, a 7-day pass costs 28,300 yen, a 14-day one costs 45,100 yen. A huge difference of 11,500 yen between both if you compare it with two 7-day passes (56,600 yen). I said I’ll check first and that makes it the wisest decision I’ve made today. I looked up for other distributors on the JR Pass website and called up H.I.S. International Travel to find out if they sell any 14-day JR Passes. A guy picked up the call and answered yes to my question. I went down there to get it. And I remembered this is how it looks like 3 years ago when I first got it from Chan Brothers. I suppose they ran out of 1s and 4s and can only write 7s for me. Anyway, I’m open to any reasonable explanations. It’s going to happen in about 18 days from this post. And I haven’t even changed all the money yet because of the poor exchange rates. 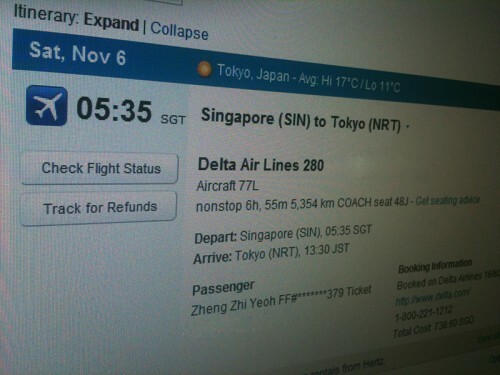 Originally planned to go for 10 days, from 6 Nov to 16 Nov. But if I can get my extra 2 days of leave approved, I’m going to spend 2 weeks there! I don’t care if I have to pay extra for the change of dates for my plane tickets. I’m even going to tap into my savings just for this trip. At first I was anxious, scared, wanted to change my mind. But after seeing some photos other people took on their visit to Japan, I’ve got the sudden urge to just teleport there right now! Too bad I can’t. This time, I will be meeting up with a lot of people there whom I’ve met through Final Fantasy XI. Mostly linkshell friends from TeamKANICAN. The only linkshell I felt most at home with!